A few weeks ago, I wrote about the Pano5+1 Mk II, a panoramic head for GoPro that enables you to capture 65+ mp fully spherical 360 photos. 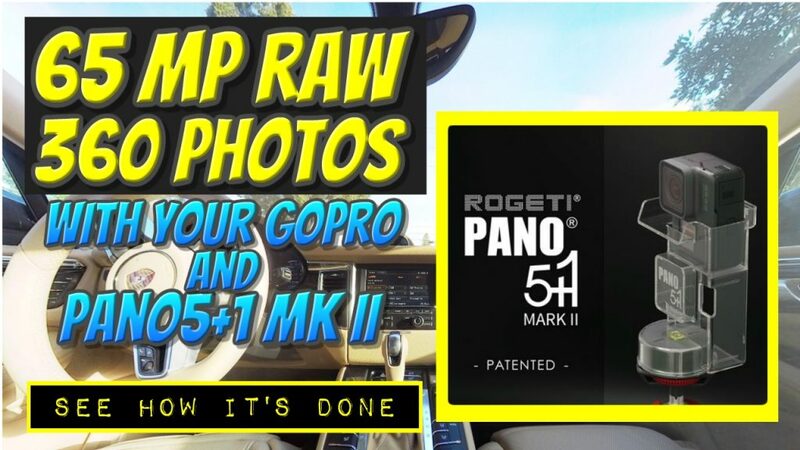 If you use a GoPro Hero 5 Black, you can even take the photo in Raw format. I backed the project and got the package a few weeks ago, even before the end of the campaign! Here’s a tutorial, sample photo, and review. 360 cameras can take great photos, but sometimes you want a little more detail. Another issue with 360 cameras is the parallax stitching errors seen in objects within the stitch line, especially when they are close to the camera. One way to get around these issues is to use a panoramic tripod head and an interchangeable lens camera, which can take high resolution 360 photos that have no parallax stitching error, but the whole kit can be pricey and is usually not very portable. A lower cost and more convenient alternative is the Pano5+1, a panoramic head designed for GoPro cameras. Like its bigger DSLR-based brothers, the Pano5+1 has no parallax stitching errors, and takes higher resolution 360 photos, but does so in a package that is more affordable and convenient to bring and use. The Pano5+1 Mk II improves on the original model by being compatible with Hero 5 Black (which can take raw photos, among other features), and adds a nadir shot holder to facilitate taking fully spherical 360 photos. All the parts are very well made and injection molded, not merely 3D printed. You can tell a lot of thought went into the design. For example, the Pano5+1 has a compartment for storing a Hero 5 Back camera (or a Hero 3 or 4 with adapter), and the the storage case has space for two extra GoPro batteries. Taking a photo with the Pano5+1 is pretty simple. You take 5 shots horizontally, add one shot for the zenith, and two shots for the nadir (technically you only need one, but taking two shots allows you to remove the stem of the nadir holder). Tip: for the zenith shot, be careful to put the lens toward the side of the logo, to maintain the nodal point. If you put the lens on the other side, it will not stitch correctly. As with the original Pano5+1, you can use the tripod holder with a water bottle (I tried Dasani and Smartwater, while Arrowhead doesn’t seem to fit) or sports drink bottle (but I haven’t tried). One advantage of using a water bottle is that there won’t be tripod legs appearing in the photo. Naturally, taking photos with the Pano5+1 takes more time than with a 360 camera. However, it is still fairly easy compared to traditional panoramic photography, especially if you use a Hero 5 Black with voice control. I didn’t have to do any editing or customization at all. It stitched perfectly in PanoramaStudio 3.1 Pro. Compared to the Panohero which I had used with the Yi Action Camera, the Pano5+1 seems to create photos that are much easier to stitch, and with stitching that is close to perfect. I was so surprised by the [nearly] perfect stitching that I tried it next with our minivan. Recall that car interiors are challenging subjects for many 360 cameras because there are many things close to the camera, and the many straight lines will easily reveal errors. Nonetheless, my photo also stitched perfectly. To summarize, the Pano5+1 works as advertised as long as you are careful not to move the tripod. Even if you already have a 360 camera, it would be a great way to complement your 360 camera by enabling you to take higher resolution 360 photos even in tight spaces, such as for car interiors and real estate. – Pano5+1, is available here. – PanoramaStudio 3.1 Pro, the software I used, is available here. – GoPro Hero 3, Hero 4, Hero 5 Black. Thank you very much for using these links to support 360 Rumors at no additional cost to you so I can do more tests and reviews! Ordered one. I have a Hero 5, so what the heck. Your results look impressive. That’s an interesting device, maybe the best thing between DSLR and 360 camera but somehow it looks like distortion is really important. I’m not a pro in 360 photography, here is my first 360 picture taken with my DSLR: https://www.laurentwillen.be/circuits/circuit-italie/catane/. I don’t have that kind of distortion there. Of course it’s more expensive gear and it’s takes probably longer to setup (it takes me 5 to 6 minutes to take all shots if nobody is in the way). Hi Laurent. Thanks for sharing your photo. The distortion is just a function of the viewer / player used. Some players have a wider view which appears more distorted. What is the recommended set up for the GoPro Hero 5 photos? Is there a way to take HDR photos with it? Thank you in advanced for your advice! Hi Ofelia. I recommend using base ISO of 100. Yes you can take HDR by using the WDR mode. swipe left to reveal advanced settings, then go to the 2nd page (swipe left again). You’ll see the WDR option. Since you have done both comparison between the Pano Hero and the Pano 5+1 Mark II, which one do you think is the best? + if there are people or moving things in the shot, it’s easier to make sure they are not split up. Saw this review recently and bought this and the Herdima. The Rogeti seems the better buy. The Pano Hero came from Shapeways and was not quite the build. Pano5+1 MKII stitched my Hero 6 jpgs perfectly! (small room8x9, using PTGUI) . Will try shooting RAW, 100 ISO and locked exposure. Great low entry cost quality! Thanks for your review(s).